Not too high a flow as this delicate plant breaks easily. Do not place it in with fish or other animals that may trample on it or push it aside as it is quite brittle. 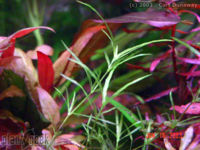 This mainly floating plant consists of small thin leaves on thin brittle stems that are closely packed together rather like Java moss. It can be planted in the substrate. But it prefers to float. It is native to many parts of the USA. This page was last edited on 22 August 2011, at 12:25.